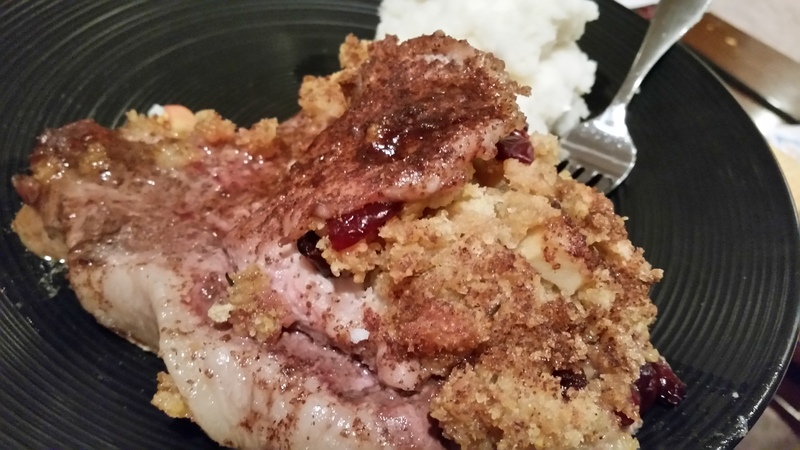 Pork Chops Stuffed with Cornbread, Apple and Craisin Stuffing – What's for Dinner Moms? It’s the beginning of the month so I am on the lookout for sales on meat for the month. They had 1″ plus thick pork chops on sale for $1.49 a pound. These are the perfect thickness for stuffing with all kinds of good things. It is fall so my mind immediately turns to stuffing, apples and Craisins. These were so amazing. I know the picture is far from good but I wish I could have you smell them! Oh, my Goodness! We topped them with a bit of melted butter and a mixture of cinnamon and sugar sprinkled over them. It was delicious! We served this with mashed potatoes and green beans to complete the meal. Preheat oven to 350 degrees. Spray a 13″ x 9″ casserole dish well with non-stick cooking spray. Slice open pork chops horizontally leaving about 1″ from cutting all the way through. When you open the two sides it looks like a butterfly. Mix together stuffing mix, butter, chicken stock, apple and Craisins. Take a decent amount of stuffing and place it between the two halves. Press closed. Lay the pork chops in the prepared dish. IF there are to many prepare a second dish. Don’t over crowd the dish. Once all pork chops are stuffed drizzle the melted butter from the topping over the pork chops then sprinkle with the cinnamon sugar mixture. Bake uncovered for 30 to 40 minutes until thermometer inserted in pork reads 150 to 160. Remove pan from oven and let rest for 5 minutes before serving. Temperature of pork will continue to rise as it rests. 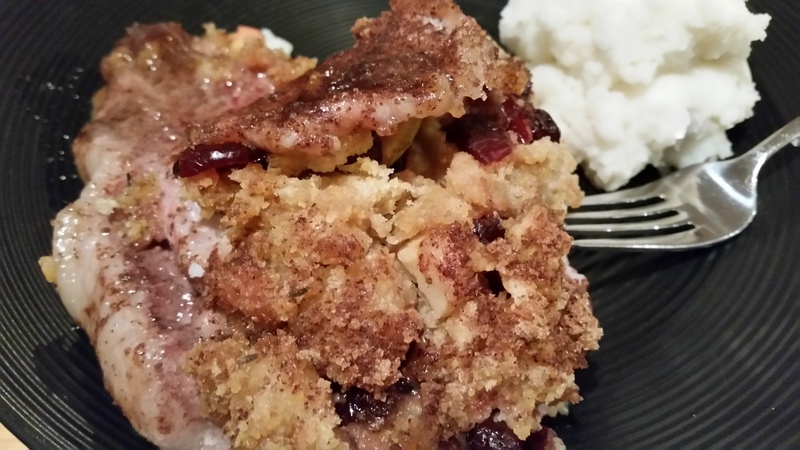 Yumm a great Fall recipe! Oh, yummy!!! Just printed it! These are like deluxe pork chops and I can only imagine the smell! Thank you, Sylvester. It had such a great cinnamon/buttery smell.